Peel and slice the onion into thin rings. Soak the onion in the buttermilk for at least 30 minutes. Set up your barbecue for direct cooking. Please refer to your handbook for further instructions. Place a Q Ware Frying Pan in the barbecue. Preheat your barbecue for 10 minutes. While the barbecue is preheating, finish preparing the onion rings. In a bowl, combine the plain flour, cayenne pepper (optional), salt and pepper. Remove the onion rings one by one from the buttermilk, toss in the flour mixture and set aside until required. Once the barbecue has preheated, adjust the burner control(s) to medium. Pour the vegetable oil into the frying pan, for shallow frying. Cook the onion rings in batches in the frying pan for 4 minutes, keeping the lid down in between flipping the onion rings halfway. Place the cooked onion rings on paper towel. While the onion rings are cooking, prepare the sausages. In a small bowl, combine the barbecue sauce and smoked paprika. Brush the sausages with the barbecue sauce and wrap two strips of streaky bacon around each sausage, secure with toothpicks. Cut the hot dog buns in half and butter. When the onion rings are all cooked, remove the frying pan from the barbecue using the detachable handle and heatproof gloves. Place the sausages on the barbecue and cook for 16 minutes, turning each quarter or until the bacon is crispy. Place the buns on the barbecue, buttered side down and toast for 1 minute. 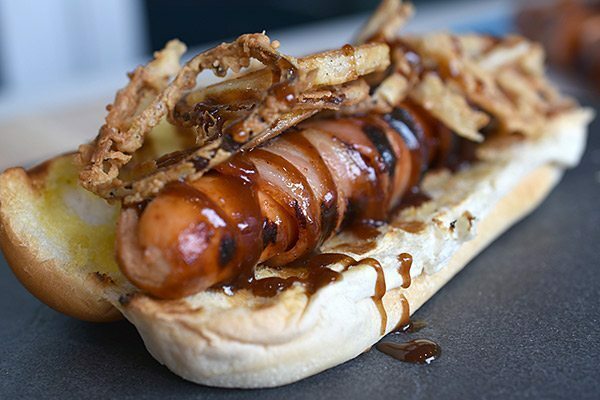 Serve the bacon wrapped sausages in the toasted bun and top with the crispy onion rings.